Into a food processor (much easier if you have one, but you can do it by hand) place the flour, xanthan gum, tapioca flour, salt, nutmeg, olive oil and all the eggs, pulse to combine. Start by adding 1/3 cup of warm water and mix the dough. It should come together into a ball. It shouldn't be wet or sticky but a nice soft dough. I usually add a drop more water and not another whole 1/3 cup. Check by pressing your finger into the dough, it should be pliable and not too hard. Remove the dough from the processor and knead it on a surface dusted with rice flour. The dough should be lovely and smooth. Divide the dough into four portions and wrap in cling film. Allow it to rest in the fridge for at least and hour. This dough does not harden in the fridge so it is lovely and easy to work with. Roast the pumpkin in the oven with a little olive oil and a sprinkle of salt. When it is ready allow it to cool before mixing it with the ricotta, nutmeg, salt and pepper. By roasting the pumpkin, there shouldn't be too much water in the mixture. You need to be able to spoon the pumpkin mixture onto the pasta without it spreading. Roll the pasta through the pasta machine. (hoping you have used one before) Keep the shape as rectangular as possible while passing it through the pasta machine. The first roll is the toughest so simply roll it on the first setting a couple of times before moving on. This dough is very strong and can usually go to about setting 5-6. You really want as thin a pasta sheet as you can get. Lay the pasta sheet onto a rice floured surface. Using a 6cm cookie cutter, cut out rounds for the base. I like to use a larger cookie cutter for the tops - a 7.5cm. Place a teaspoon dollop of your pumpkin mixture into the middle of each pasta round, making sure to leave a good centimeter around the edge. Dip your finger into a cup of water and run it around the edge of each pasta circle before popping the top on. This will help seal the two: bottom and top together. 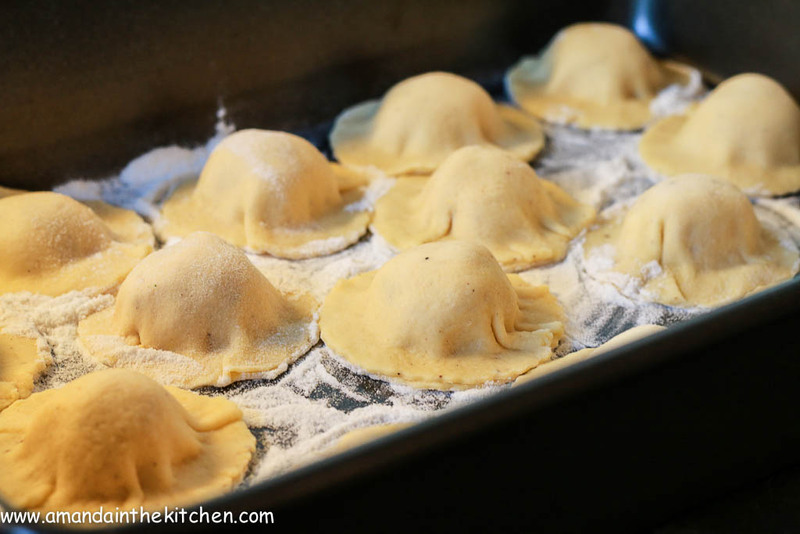 Using your fingers press the ravioli into its shape, sealing the little mound of pumpkin in the middle. 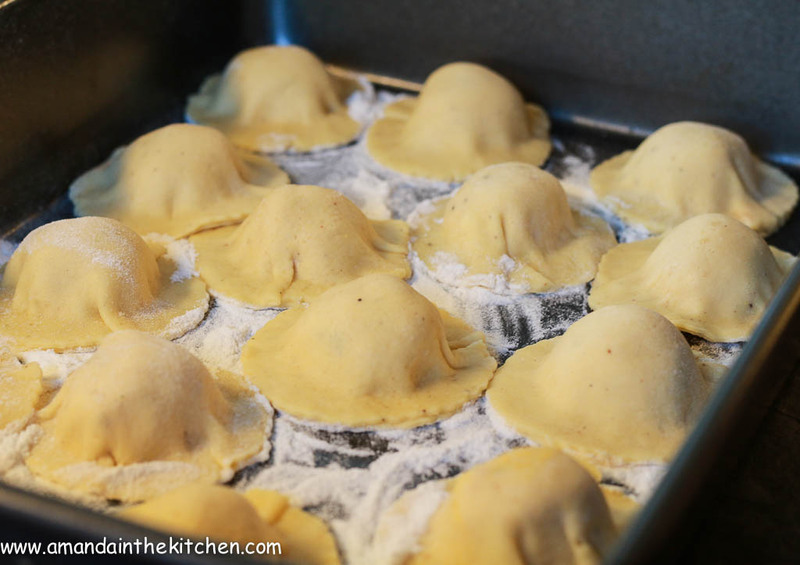 Lay the complete ravioli's onto a floured tray under a dish cloth, to not let them dry out. This method may seem very long and complicated, but once you get a little system going it goes very quickly. 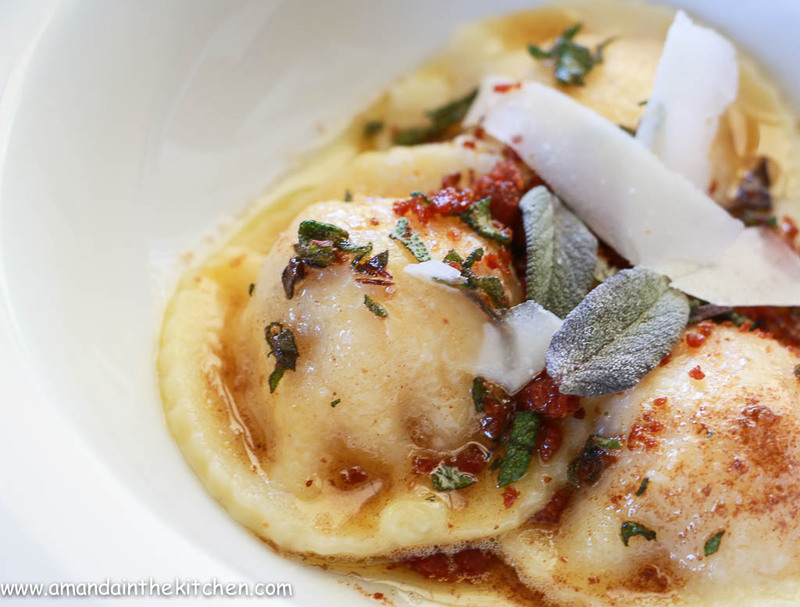 Heat up a pot of salted water to cook the ravioli's. Melt the butter in a saucepan until it is bubbling and a little brown, add the lemon juice and sage leaves. This will sizzle and spit. Allow this to sit while you cook your pasta. To make a chorizo crumb: fry off slices of chorizo in a pan until crisp. (no need to add oil as there is enough fat in chorizo) When cooled blitz them in a food processor or blender until they are crumbs. 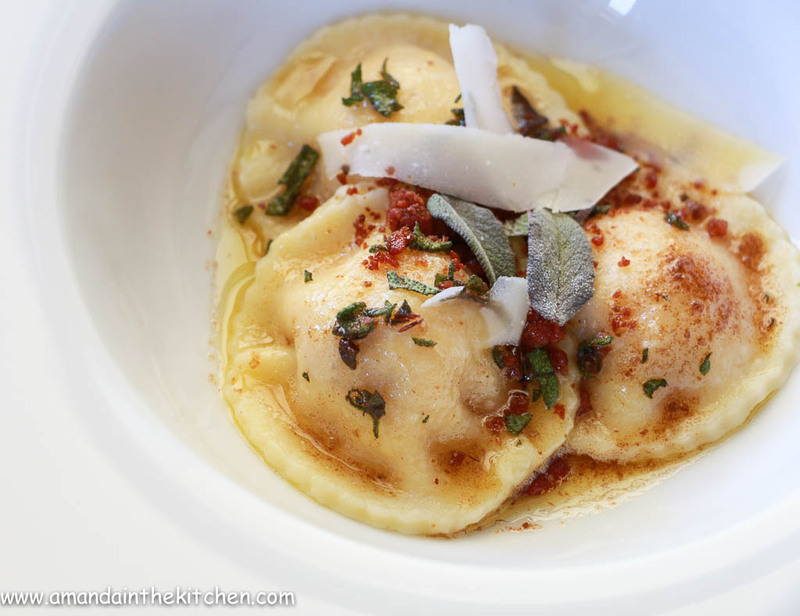 These keep in the fridge for a few days and are wonderful as a garnish for many dishes. Add the ravioli's to the boiling water and allow to cook for about 5 minutes. Drain into a colander. Heat up the butter sauce making sure it is a lovely brown colour and tastes nutty. Season with a little salt. 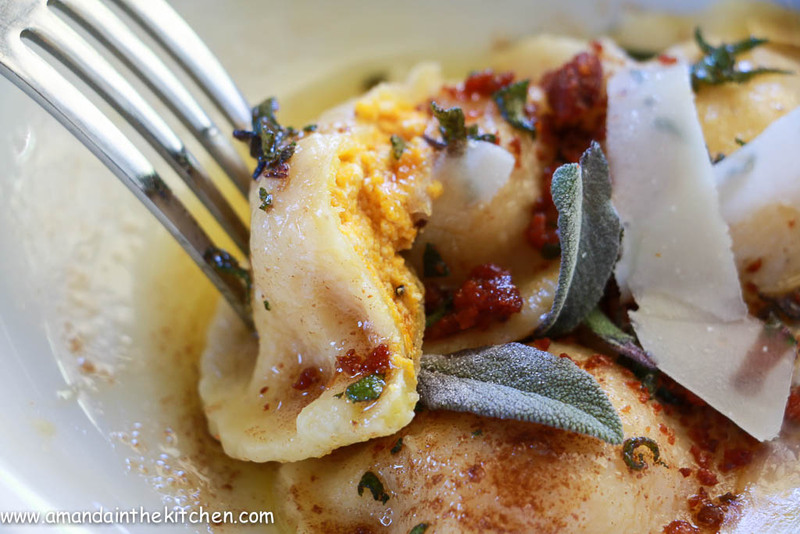 To serve lay a few ravioli's in a bowl, top with the butter sauce and a sprinkle of chorizo and parmesan. This really is worth the effort!